Quickie update from a windy Round 6 of the Scottish Cyclocross Series at Meadowmill hosted by series sponsors The Tri Centre. Results from Race 1 for the Under 12's. As you might have noticed we have had a wee bit of trouble with the sign-on sheets for the U12 race, if this still doesn't make sense for your little ripper get in touch! Results from Race 2 for the Youths. Results from Race 3 for the Senior Women and Juniors. Results from Race 4 for the Veterans. Results from Race 5 for the Senior Men. Prizes will be mailed out or get in touch with Simon or Stuart via info@thetricentre.com to arrange an alternative. 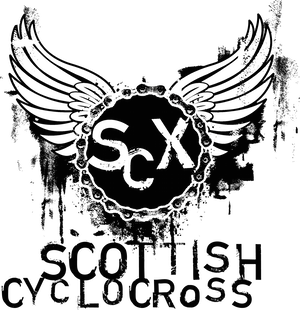 Please email any comments or corrections to scottishcyclocross@gmail.com, note we did not manage to capture everyone's team/club details at sign on. Many thanks to all those who turned out for a gale-force cross race yesterday! Apologies for the lack of prizegiving on the day - the distance from the main building to the start area made it difficult logistically to co-ordinate this. As it was we all walked about 20 miles during the day (at least my legs feel like it). We will mail out the prizes this week so you won't miss out. Also a small comment about parking: - the venue appeared to have triple booked and we had to have two of our guys act as parking attendants for much of the morning - further spreading our resources. We are sorry if anyone had parking problems. Good work getting the results up so quickly, thanks for this! Thought both youth and senior courses looked great esp the steps, should have brought a kite though. Hey lads is there any photos of the junior race kicking abput?